Governor Terry Branstad says he’s not surprised his fellow Republicans in the legislature have been reluctant to embrace his regulatory reduction plans. Branstad’s bill that would have ended state licensing for barbershops, social workers, mental health counselors and other health care professionals was rejected by a three-member House panel. Republican Representative Bobby Kaufmann of Wilton suggested the move could “harm the public” by inviting pretenders into the state who would act as if they had legitimate training in the health care field. Branstad says there are too many state-licensed professions in Iowa. Another proposal Branstad backed tried to change state regulations to make it easier for health care clinics that are for-profit to set up shop near already existing Iowa hospitals and clinics. That bill failed to advance in the Iowa House, too, because of opposition from Republicans. Branstad says these kinds of regulatory reforms will “never be easy” to get through the legislature. Branstad made his comments late Thursday during an interview with reporters from the Radio Iowa and The Cedar Rapids Gazette. Branstad was wearing a red lapel pin at the time. 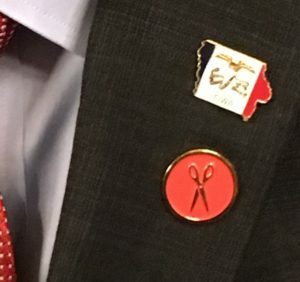 Kentucky’s Republican governor, Matt Bevin, gave Branstad the pin, which featured a tiny pair of scissors. It’s a symbol of the Kentucky governor’s “red tape reduction” campaign.